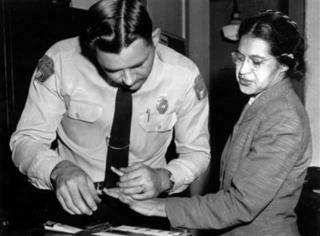 Like many of you, I have always been inspired by the life and story of Rosa Park. Ms. Parks passed away yesterday at the age of 92. Much has been written across the web about her life and importance. I will not add much to that discussion with a lengthy post here, but I will say that many more of us need her courage and uprightness in the face of the social ills that plague our world. May God bless us with the strength to stand up! I think Albert Pujols’ 9th-inning home run against the Astros last night is still traveling down Texas Ave–it might be in San Antonio by now. Have you ever seen a ball more perfectly and purely hit? 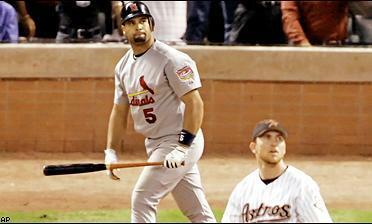 By the way, Astros: WALK PUJOLS. He’s the best hitter in baseball and if you hang a slider in the middle of the zone, he’s gonna crush it!…But I guess we ALL know that now. Brad Lidge said that you don’t walk a guy and put the tying run on second base, even if it is Babe Ruth. Okay. Whatever! I wish it were Babe Ruth…he’s dead! Don’t you remember a few years ago when Bobby Valentine’s Mets walked Barry Bonds when the bases were loaded? The Mets had a 3 run lead and figured a two run lead was better than letting Barry swing with three men on base. Smart thinking. The series goes back to St. Louis and Busch Stadium. It’s gonna be great. I predict the ‘Stros will pull it out and be headed to their first World Series. After that all bets are off. The White Sox had a great season and may be a team of destiny. Remember: the White Sox have thrown a World Series more recently than they’ve won one. Fate may be on their side. Or, the Black Sox scandal may forever jinx them from winning the series. Either way, before the Series begins, go check out one of my all time favorite movies, Eight Men Out. Ahh! October. Some argue that October is the best month of the sports year. They have good case. Basketball is about to get started, college and professional football will are in full swing and the Major League Baseball playoffs have begun. Last night, Rochelle was asking me to catch her up on the past 5 months of baseball. She doesn’t really pay attention until the playoffs, but as the post-season goes deeper, she will stay up late into the night, living and dying with every pitch or hit of whichever team she choose to cheer for in the next few days. Here is Houston, my hometown Astros and 1 game up on my former hometown Braves. I live in Houston and follow the team all year, but I’ve been a Braves fan from the crib–thanks to TBS, The Super-Station. People frequently ask me who I’m pulling for. My response: “I can’t lose!” Though between the two of us, my heart is still in Atlanta. I told you so, I told you so! There it was in the New York Times, which arrives with precision in my e-mail inbox every morning. The headline: Hand Washing Habits Not in Sync with Answers. The article tells in statistics what I already knew in my heart: “Most people say they wash their hands after using the bathroom. But a study suggests they don’t.” A Harris Interactive poll asked 1,013 adults about hand-washing and then the researchers sent observers into public restrooms to see what actually happened. 91% of adults said they washed their hands after using a public restroom, but observers say only 82% actually did. Women washed their hands to a tune of 90%, but only 75% of men washed. That means that the nest time you go to church or the office or a party 1 out of 4 men who shake your hand has not washed them after…well, you know. And I suspect, if you are like me you know EXACTLY who that fourth guy is! But there I go again, focusing on the physical dirt of others rather than the spiritual dirt of my own. Do you ever do that?